For those of you waiting for the Motorola Moto X, here is a nice way to start the weekend. A press render of the eagerly awaited handset was leaked and shows that the phone is ready for its expected August 1st introduction. As we told you previously, this is not a Times Square scream it from the sky type of announcement. 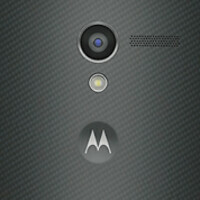 Motorola will hold five separate sessions with the press and the embargo will expire at 3pm EDT. We will be at one of the sessions and as soon as we can, we will pass along to you the big news. The different approach to the unveiling suggests how Google and Motorola wants this phone to be seen by the public. It is not a model for the power user who has to have the fastest processor or the phone that scored the highest on the AnTuTu benchmark site. We all know someone like that. If that is what you're after, we should see some nice top-shelf specs coming from the new Motorola DROID Ultra models that are expected to be introduced as soon as Tuesday by Verizon. The appeal of the Motorola Moto X is to the person who wants to put together a phone (from the outside) that he can call his own with a combination of colors to choose from for the back cover and trim of the device. There could be more than 20 colors to choose from, which could allow for a fairly large number of different color combinations. Remember, the customized version of the phone will be available online only. For many of you, August 1st can't come soon enough. Until then, feel free to stare at the picture below. I'd still prefer a 5-inch screen. It's still the year 2013 after all. it's a 4.5" inch screen not 4.7", still not bad , about 4.2" inch of usable screen, the semi transparent navigation keys make it look bigger and when it come to games and videos , you can also use the (FullScreen) App found in google play that will hide the soft keys and notification bar and have full screen usability . 4.5" is pretty good.just barely bigger than iphone 5 its the perfect overall phone size. the most important question that haven't been answered yet is : battery and storage size? it's actually full!screen not fullscreen, sorry. that's very fine with me, but the latest reports say it is a 4.5". and in the Vietnamese video that's on the web in you pause it at 1:24 and compare it to the iphone 5 next to it , it do look more like a 4.5". The latest reports say 4.7". They also say it was measured and confirmed with someone who had the device in hand. See.. AndroidPolice.. GSMArena.. etc. thank you i will, for the overall size of the phone, 4.7" sound even sweeter . That Vietnamese video states that they meaured it between 4.65" and 4.7" so ya. Yeah, the big hand argument is ridiculous. I get if you don't like a big screen for whatever reason, but it's not because it's too big to handle. My wife has a S4 and she has very small hands. She does just fine. Agreed. My gf has the S4 and has tiny hands. GS4 is a very different 5 inch beast. Companies like HTC and so have no regards for the size. Samsung is the only one that uses the thinnest plastics possible to keep the phone small yet durable. Unfortunately, people knock them for it but that is the main reason why women can handle the GS4 easily, because of the "cheap" plastic. 4,5 / 4,7 is the best i think. Let's see who will win android user this year, honami or moto x or htc, and sorry samsung. I feel enough for note 1 and S3, it's time for change. Nice curve, round shapes, and looks iconic. By the way good looking phone though. I wonder if the little divot with the Motorola symbol will do anything. This is a nice looking phone honestly. Price it under $350, and you just may get my money. Well, looks like I'll have to make a decision. Do I get this on an employee plan and sacrifice customization? Do I buy it unlocked after saving 300 bucks? Do I forgo this and get the new Maxx, after saving 200 bucks (or more), sacrificing customization and likely speed of updates? For anyone's information, I won't be able to root the Maxx, as simply getting caught with a rooted phone by the wrong carrier reps could get me in huge trouble. I've run the risk with my Atrix for the last several months. I wouldn't like to keep doing so. Main reasons to get the Maxx would be for the durability and battery life. Oh, and for the love of God I hope that they finally have a good camera this time. Can I say moto x? 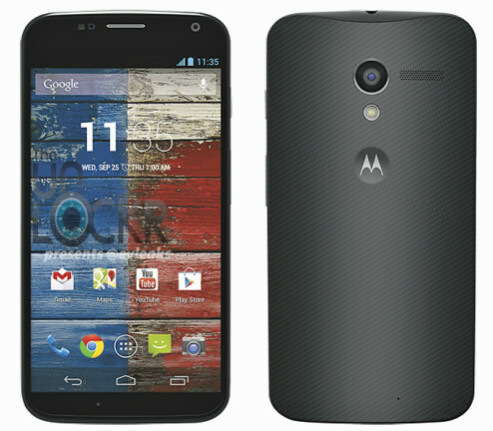 It looks nice, but the problem is that some countries don't have Motorola anymore, including mine. So, I hope Motorola will return since they're calling themselves the "New Moto". this is cool moto!!! its doesnt look nexus phone on front, the back is laso something new (unlike HTC One copy of xperia P) thanks to the top corner thing. I don't see anything revolutionary. Do you?